What is the Shanghai Diamond League? The Diamond League is an exciting fourteen-leg series of track and field meetings. This is the ninth year with the 2018 Diamond League continuing with this event in China's Shanghai Stadium. The second Diamond League meeting, in Shanghai, will take place today at 5:40pm Shanghai time - that's 10:40am BST, 5:40am ET, 2:40am PT and 7:40pm AEST. The Diamond League moves on to Shanghai, China for its second weekend. 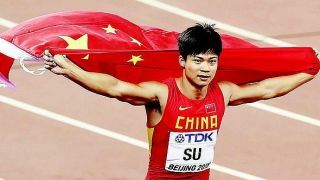 Expect the home crowd to be fervently cheering on its own athletes at the mighty Shanghai Stadium. Meanwhile, you can wave your respective country's flag from the comfort of your own home by using this handy guide to help you watch the athletics live via a live stream. At Doha last week, USA took the win in the 200m men's and 100m hurdles women's while Kenya cleaned up in the men's 800m and 1500m and the women's 3,000m as well. Ethiopia took first place across the men's 1500m and 3000m steeplechase while local hero Mutaz Barshim was the predicted winner of the high jump. The action is expected to be even more exciting this week as China's athletes want to shine on their home turf. Su Bingtian, the Chinese men's 100m record holder, will face stiff competition from World Champion Justin Gatlin and there's plenty more local interest across track and field. This is the second year of the new scoring system which means any country could stop the US rot when it comes to team points. The idea behind this league was to enhance the worldwide appeal of the old Golden League by going outside of Europe for the first time. That means new countries like China, Qatar, Morocco and the US were added when founded back in 2010, making it a truly international set of meets. And you can watch all the athletics live thanks to our handy guide. Read on to find out how. Catching world-class athletics is pretty easy in certain countries like the UK and the US, but it hasn't always been so simple in other countries. Luckily, the growing popularity of VPNs have helped in that department. If you don't have easy access to watch the Shanghai Diamond League where you live, the best way to live stream is to download and install a VPN - that let's you alter your IP address to a country where it is streaming. For US residents the Shanghai Diamond League will all be available to watch on NBC, NBCSN or the Olympic Channel from 5:40am ET, 2:40am PT. Despite the odd hour, this is ideal as you can watch this over your internet connection via NBC.com with a gold pass, meaning it can be enjoyed on many devices from wherever you are. UK residents will be able to enjoy all the action from Eurosport, with coverage starting at 10:40am BST. That means you have a few options as this is broadcast via a Sky, Virgin Media or BT subscription. Or catch the highlights the next day at midday on BBC 2. If you don't have any of those then you can subscribe to the Eurosport Player and enjoy everything via an app on your smartphone, tablet or computer. You can get a monthly or annual pass, or even a free trial for which is available here if your interest starts and ends with the Shanghai athletics meeting. For Canadians watching the event it's relatively easy as the entire Shanghai Diamond League will be aired by CBC from 5:40am in Ottawa time. The channel will also be live streaming them so if you need to access to any events via the internet, you have that option as well. Australians with Eurosport, you're in luck. The sports channel will be covering the Shanghai Diamond League event from 8pm. This is available through the Eurosport app with a subscription that means you can watch it from plenty of devices anywhere with a good enough data connection.